A revolutionary technique combines the best aspects of several usual teeth whitening techniques. This technique ensures a dentition of a star in a single visit. The custom-made trays technique is extremely effective and safe for the teeth and their enamel. The trays contain a denser and more concentrated whitening gel than the ones sold in pharmacies, which makes ingestion impossible and prevents the inflammation of soft tissues. This technique allows a level of whitening that could not be attained with usual techniques before, even in people whose teeth present a resistance to the whitening gel. Offered at a competitive price, the technique gives an exceptional and almost permanent result: then, simple visits are occasionally needed to preserve your smile’s whiteness, for a long period of time. Also, the whitening (on a chair) with the help of lamps and lasers gives a good start that allows us to reduce the time of treatment with the tray technique at home. Used alone, it is short-lived and less effective. Strips bought in pharmacy only whiten the flat surface of the teeth. They are only effective for a short period, especially in people 40 or older. Finally, the high-concentration whitening used with trays that are not custom-made and used without the supervision of a dentist can lead to irreversible side effects to the dental tissue and its neighboring components. Consult us to know more about this treatment! We are very pleased to say that we have reached the GOLD PLUS level as an Invisalign supplier. 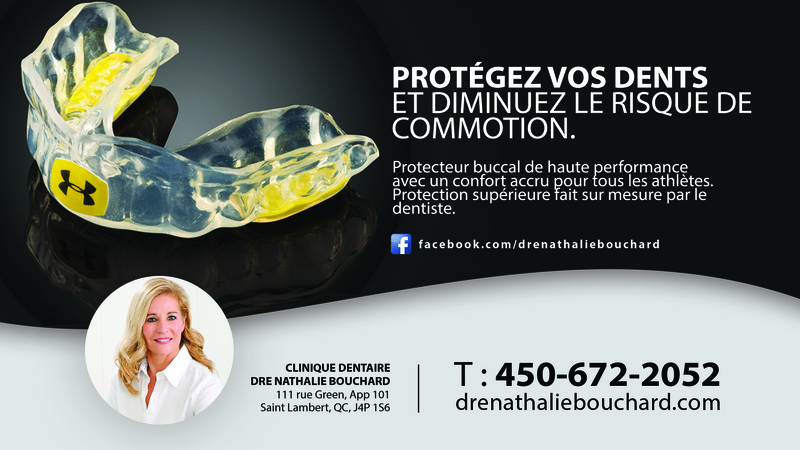 Always on the lookout for innovation, Dre Nathalie Bouchard is constantly perfecting her expertise, in order to offer clients state of the art dental science.